Talk about dislocation – try meeting up with college roommates, camping out in a dorm room, and attending classes at the university you attended two decades ago (and then some). There’s nothing like it for making you think you’ve somehow jumped back in time – darn all those changes on campus for reminding me that I haven’t really time-traveled! Last fall when I was mired in grief and shock, my wise friend suggested that we plan something for me to look forward to. That something was Women’s Conference. 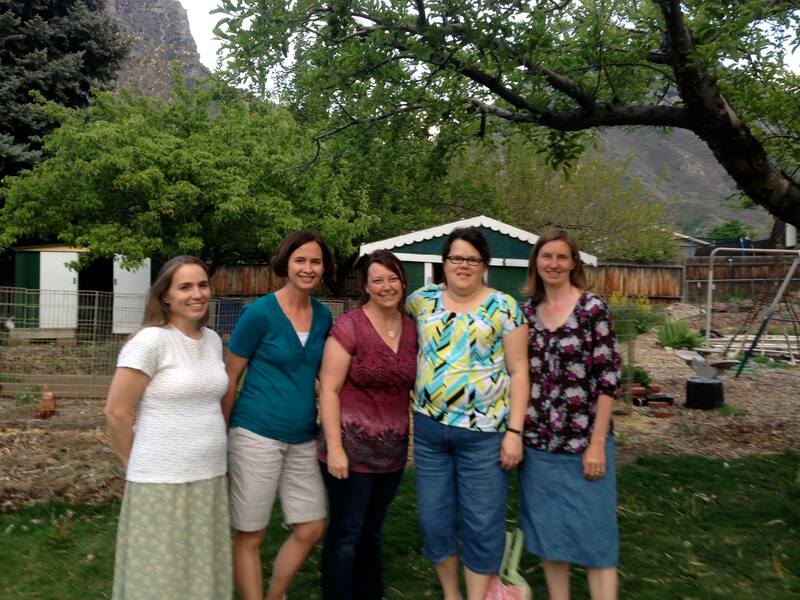 Beth contacted all our college roommates about the plan, kept us on track, and finally created the obligation that pulled me to Provo, even though I was having such a hard time getting things arranged for my kids. It is sooo much easier to have a husband at home who can just take care of getting kids to and from school and their activities!! Thanks to a handful of friends and family who took over childcare duties, I arrived in Salt Lake City with a big sigh of relief. Talking a mile a minute, Clarrisa and I drove to Provo and checked in and got our dorm keys!! Suddenly I felt like a college freshman again 🙂 Beth showed up and we got food at the BYU Creamery (famous for their ice cream) and took a brisk walk around campus and stayed up way too late catching up. But it was just as well, because our room was incredibly stuffy and hot and the sleeping wasn’t very good that first night. After a long walk around the Provo temple the next morning (at least it wasn’t after midnight like our freshman “Fitness for Life” runs), we got ourselves over to the Marriot Center for the opening address. The theme of the conference was “my soul delighteth in the covenants of the Lord”. Throughout the two days of classes, I kept coming back to thoughts of how making promises to God has helped me access His help and guidance the past eight months (not that I didn’t before, but I have been especially grateful for His help since Tom died). I also found myself considering how my covenants can help me get out of some of the ruts I have found myself in. While I have tried to be gentle with myself when I’m not feeling very happy or energetic, I can also see where it is time to push myself a bit and start finding some new purposes and ways to be joyful. Although I didn’t take as many notes as my brilliant friends, I did jot down some things I want to do differently. One of the things I had the most fun doing was participating in the service projects associated with the conference. They had “Take and Make” kits to carry around and work on while in class – I made a few child-size crocheted hats. Thursday evening we worked on lacing cards (we punched holes in foam shapes – I was covered in hole punching confetti thanks to the inherent static generated by working with foam!!). Then we helped put together meals for Feeding Children Everywhere (we rocked some awesome hair nets – Beth and I were an amazing bag sealing team!). It was incredible to see so many people pitching in and working on such diverse projects – the power of women when we are united!! The very best part of the trip was reconnecting with friends. I will admit I was a little worried that I wouldn’t have enough to say over the course of four days to women I haven’t talked to regularly in years (I think we decided that JoAnn and I hadn’t seen each other since our sophomore year of college!) but it is a testament to good friends, that no matter the time that passes, good friendship chemistry still holds sway!! Every night we vowed to “get to bed earlier” (notice there wasn’t an exact time involved) but the only thing that stopped us talking was getting so exhausted that we couldn’t say another thing. It felt just like those late nights when Beth and I would lay in our beds in the dark and talk until we fell asleep mid-sentence. All good friendships need a periodic dose of late night talks! !